Mode of Trekking / Climbing : Tea-House / Lodge & Camping. Highest elevation on Trek : 5,416m. The Thorangla. Trekking / Climb duration : 17 days. Total Trip : 21 days. Our company Arrange the journey to Pisang peak which rises from yak pastures above the village of Pisang, in a uniform slope to the final summit pyramid is an undistinguished snow and ice slope. Looking from above Humde the peak is more interesting and can be seen as a curved ridge, with the face above Pisang being the truncated southern end of the mountain. This is made up of steeply tilted rock, the dip slope of which faces the valley and is well seen in this peak and the great rock further down the Gyaru & Pisang valley. It has a lot of scope for exploration and pioneering, the whole of this area from western which is guarded by a hanging glacier appear to offer a considerable challenge traverse of the whole summit ridge which connects to a more northern summit before curving back west looks a superb possibility, towards the western ridge, however looks problematical as the ridge is guarded by a huge rock slabs, a feature on this side of the valley. The first ascent was made solo by J.Wellenkamp in 1955 during a German expedition to Annapurna. 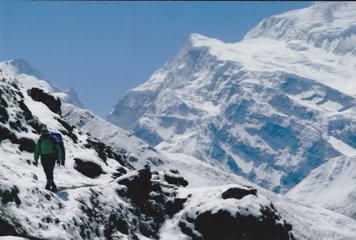 This same expedition also made an ascent of Chulu East. From upper Pisang village ascend a path through sparse wood and pastures to a kharka at 4,380 meters , which provides a good site for base camp. A faint trail continues on open hillside, following a ridge and climbing to a shoulder on the south-west ridge at 5,400m a suitable site for high camp. Under some conditions this may be under snow. Above, a well defined ridge leads to the final snow slope which leads quite steeply although without difficulty to the summit. Descent is made by the same route. Actually trekking in the Himalayas and probably in this globe offering grand views of the three highest 8000m mountain range. Annapurna, Dhaulagiri and Mt. Manaslu range, including arrays of over 6000m snow capped peaks. The trail follows the river Marsyangdi all the way to its source at the glacial lake in Manang and beyond, the walk passes through the rural farm villages and terraced farm fields from the sub-tropic, climate to the arctic landscape and through the rain forest to the alpine woodlands. Day 01: Arrive at Kathmandu over night. Day 03: Drive to Beshishar. Day 04: Trek to Ngadi. Day 09: Rest day at Pisang for acclamtisation. Day 10: Trek towards Pisang Base Camp. Day 11: Trek and climb to High Camp. Day 12: Climb of Pisang peak and return to BC. Day 14: Trek to Yak Kharka. Day 15: Trek to Thorung/ High Camp 4,740m. Day 16: Trek to Muktinath via Thorang-la Pass 5,416m. Day 17: Trek to Jomsom. Day 19: Fly or Drive to Kathmandu. Day 21: Transfer to TIA.